The final result of my garage sale last Saturday, July 10th was very satisfying. The final cheque arrived in the mail yesterday. The grand total was $1777.15 . 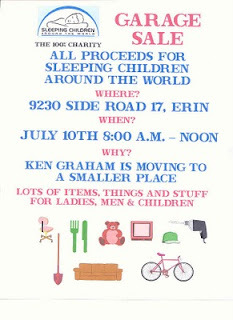 That means that 50 more children will have the benefit of a good night's sleep, new clothes and school supplies. All that plus knowing that someone thinks that they are special! On behalf of the children I want to thank all those who supported the sale in so many ways. A climb up Mount Kilimanjaro (5,895 metres/19,340 feet tall), the tallest mountain in Africa is planned for August 2010 by a group of sixteen individuals from all around the world. The majority of the group has roots in East Africa. The expedition is fully funded by the individuals in the group. 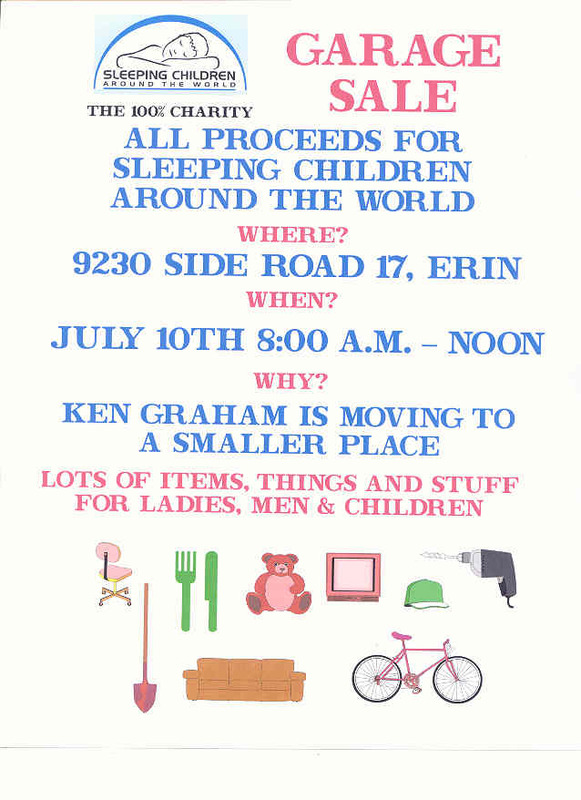 The group is raising funds for bedkits to be purchased and distributed by Sleeping Children Around the World in Tanzania this August, 2010. They are currently seeking individual and corporate sponsors. You can add your pledge by going to the SCAW website and selecting Kili Klimbers for SCAW. Mount Kilimanjaro is 5,895 metres tall. Their target is to raise at the minimum $5,896 with no upper limit. Any sponsors contribution in excess of $500 will be acknowledged through a banner to be unveiled on the summit of Mt. Kilimanjaro. 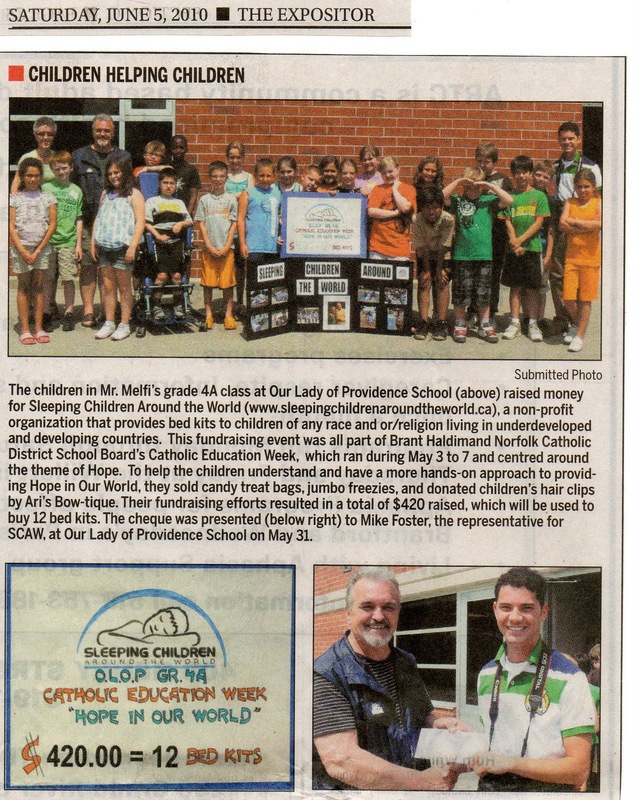 The children in Mr. Melfi's grade 4A class at Our Lady of Providence School raised money for Sleeping Children Around the World, a non-profit organization that provides bedkits to children of any race and/or religion living in underdeveloped and developing countries. This fundraising event was all part of Brant Haldimand Norfolk Catholic District School Board's Catholic Education Week, which ran during May 3 to 7 and centred around the theme of Hope. To help the children understand and have a more hands-on approach to providing Hope in Our World, they sold candy treat bags, jumbo freezies, and donated children's hair clips by Ari's Bow-tique. Their fundraising efforts resulted in a total of $420 raised, which will be used to buy 12 bedkits. The cheque was presented to Mike Foster, the representative for SCAW, at Our Lady of Providence School on May 31. Click graphic at right to see larger size. Mid-Life Riders Online, a charity motorcycle group in St. John's, Newfoundland, had their third annual ride to raise money for bedkits for Sleeping Children Around the World on May 29, 2010. They are committed to continuing with this motorcycle ride each year. Last year's ride bought bedkits that went to Nicaragua. Thanks to Mervyn House for the attached photo of this year's event. See more photos on the club's website.